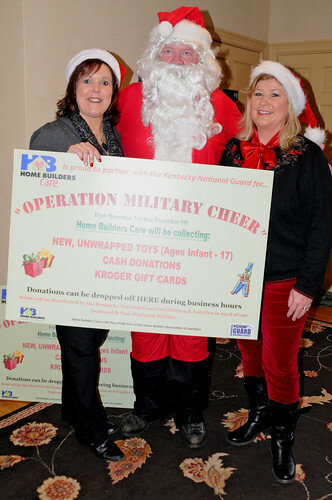 LEXINGTON, Ky. – The third annual collaboration for Operation Military Cheer kicked off Dec. 5, 2014 as members of the Home Builders Association of Lexington came together and handed off donated Christmas presents to members of the Kentucky National Guard’s Family Assistance Center in Lexington, Kentucky. Lead Child and Youth Coordinator, Cindy Culver, helps facilitate most family programs throughout the year. 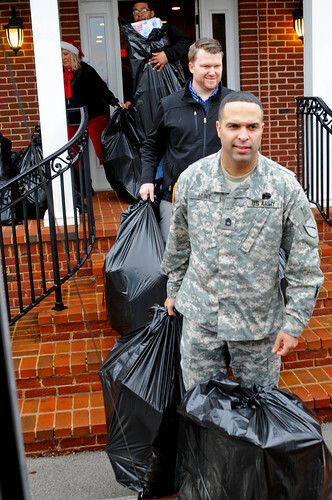 Up to this point, she and the rest of the FAC have prepared mostly by collecting information for children and families for the holiday season. The HBA filled a box truck with so many donations, that some gifts carried over into the back of another truck. One gift in particular, was greatly appreciated by Cindy. Operation Military Cheer means something different to another Family Assistance Center associate, Child and Youth Coordinator, Linda Jones. For her, Operation Military Cheer is the perfect time to give back to those who have sacrificed for her and others around her. The representatives from the HBA were very proud to offer the donations. President of Home Builder Cares, and a member of the HBA board, James Monroe, brought his family to include his wife Martha and his daughter Mary. Cindy hopes this will be another successful year and is confident in the success of Operation Military Cheer for the years to come. Check out the video on our Facebook page.